Ed and I were in Berlin* a couple years ago visiting my folks when we stumbled upon a German movie from the 1950s being shown on TV. We missed the first seconds of the credit sequence and so didn’t catch the title, but something about the opening shots of Austrian mountains and buildings felt familiar. Then the story introduced us to a novice named Maria. She doesn’t fit in well in the convent with the other nuns, and so the Mother Superior forces her to take a position as a governess to the seven children of a retired Austrian naval officer. Ed and I started thinking, my does this look familiar, could it be…? Maria gets on well with the kids and teaches them to sing Austrian folk songs, but she clashes with their father who eventually sends her back to the convent. Then he realizes he’s in love with Maria and they marry. But then the Nazis take over Austria… By now it was undeniable, this is The Sound of Music, except of course it wasn’t. 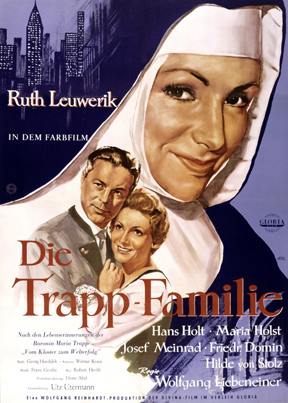 After the movie ended Ed and I looked up the German TV guide: turns out this film is Die Trapp-Familie, the first film to be made about the famous van Trapp family, and a big success in German cinemas in 1956, so big in fact they filmed a sequel: Die Trapp-Familie in Amerika. And without Die Trapp-Familie there would be no The Sound of Music. It was the German movie that attracted the attention of the original producers of the musical who brought the project to Rodgers and Hammerstein. 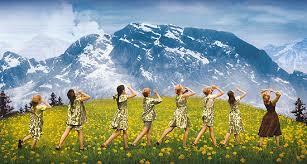 It was astounding to Ed and me to see how much the plot of The Sound of Music resembles Die Trapp-Familie. Except in the German original the van Trapp house is a fine mansion but not the palatial estate of the musical, and the van Trapp children’s names and ages are truer to history. Both movies end with the van Trapp family fleeing Nazi occupied Austria after the Germans try to force van Trapp (Baron van Trapp in the original, Captain van Trapp in the musical) to join the German military, but in Die Trapp-Familie we see the family get stranded on Ellis Island in danger of being deported. They are only allowed to enter the United States after they sing for a New York talent agent who puts them under contract. When The Sound of Music was released it broke the all time box office record Gone with the Wind had held onto for 25 years. Critics were mixed on the movie – Pauline Kael famously branded it a “sugarcoated lie” – but audiences all over the world embraced it. Well, almost all over the world. 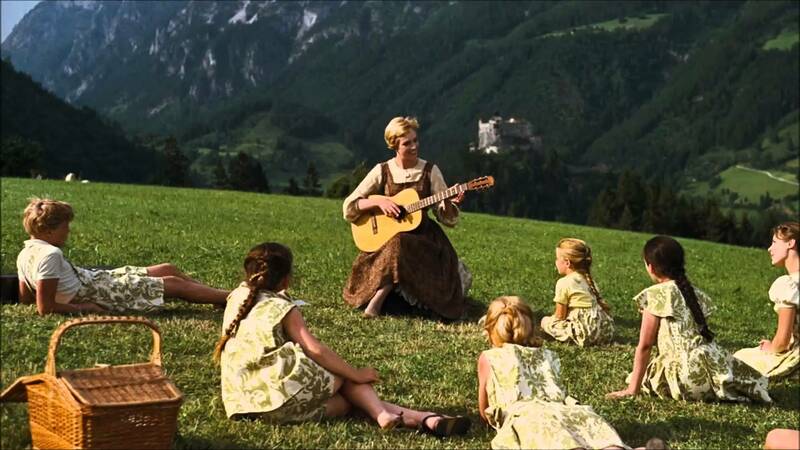 Germany and Austria never much cared for The Sound of Music, preferring the original Die Trapp-Familie. The Sound of Music is probably best first experienced as a child, just like Mary Poppins or The Wizard of Oz is best first experienced as a child. Adult appreciation of the artistry of the movie can then later remain informed by those wonderful childhood feelings of awe and joy the movie engendered. The Sound of Music is probably best not first encountered as a teenager. Which is the age I was when I first watched it. Even worse, I watched it on US television in the 1980s, which means the original widescreen image of the movie was cropped by half, destroying all visual integrity. And commercials constantly interrupted the flow of the experience. But even worse, again and again sections of the movie were edited out to make room for more commercials, mutilating any dramatic through-line if not rendering the whole plot nearly unintelligible. I loathed what I saw and would have whole-heartedly agreed with Ms. Kael’s damning assessment, had I heard about it at the time. Years later, not sure if it was the 25 year anniversary or the 30 year anniversary of the movie, a restored print was released in theaters again. A friend of mine, who knew of and tut-tutted my rejection of The Sound of Music, convinced me to go see it in the theater. And within the first audacious two minutes of the camera flying over the Austrian alps – over two minutes of glorious mountain vistas, you don’t even initially hear any music – before finally finding Julie Andrews atop a mountain and joining her for the title tune, I was won over. I quickly realized what an extremely well made movie The Sound of Music is. I loved the cinematography, which reminded me of black and white movies of the 1930s updated to widescreen and color. I loved how Salzburg and the Austrian landscape were incorporated into the musical staging, especially in the brilliantly staged and edited Do Re Mi section. The music, the performances, the story, it all shone with craft and sincerity and sweetness. Yes, The Sound of Music may be sugarcoated, but it is nonetheless sincerely good. It may not be my favorite Rodgers and Hammerstein score, or my favorite Julie Andrews movie, but who cares, it is lovely, a classic, and deserves to be beloved. I now have a special relationship with The Sound of Music because Do Re Mi is the first song (after “We’re Singing”) that I teach to my Pre-K students. We put our hands out low for the “Do” position and slowly raise it up the pitch ladder with each new note. We also indicate each note’s description with a fun gesture, like making Do’s “female deer” ears, or catching that “drop of golden sun” of Re in our hands, or making our fingers race along an imaginary road during Fa’s “long long way to run”. I unabashedly steal the “drinking a cup of tea” gesture from the movie for the seventh note “Ti”, and when we reach the top note (“Do oh oh oh…”), our hands slip down the pitch ladder and we start the chorus again, just like Maria and the van Trapp kids do repeatedly in the movie (5 times to be exact, after the intro, plus 3 versions of the bridge “When you know the notes to sing…” – that song really is an endless treat). In my Pre-K session we sing the Do Re Mi chorus three times, first slowly to get comfortable and to make sure we remember all the music and gestures, then at regular speed with a little bounce, and then at double speed, like a madly sped up cartoon, where the tea cup gesture tends to splash imaginary tea into my eyes, much to the four year olds’ delight. And my delight too. *Ed remembers us seeing the movie on Austrian TV while we were vacationing in Tirol. I remember watching it in my parent’s kitchen in Berlin. Ah, memory! At least we both remember seeing it! This entry was posted in Cinema Scope, Melodies Linger On, The Teaching Artist and tagged Austria, Die Trapp-Familie, Do Re Mi, Germany, Hammerstein, musical, Pauline Kael, Rodgers, teaching artist, television, The Sound of Music, Trapp Family. Bookmark the permalink.